Under a cloud? On Cloud 9? Love watching clouds? Ever wonder why there are so many kinds of clouds or why they have such long Latin names? Join Olympia natural-history writer Maria Mudd Ruth for presentation on these shape-shifting natural wonders that dazzle and often befuddle us. 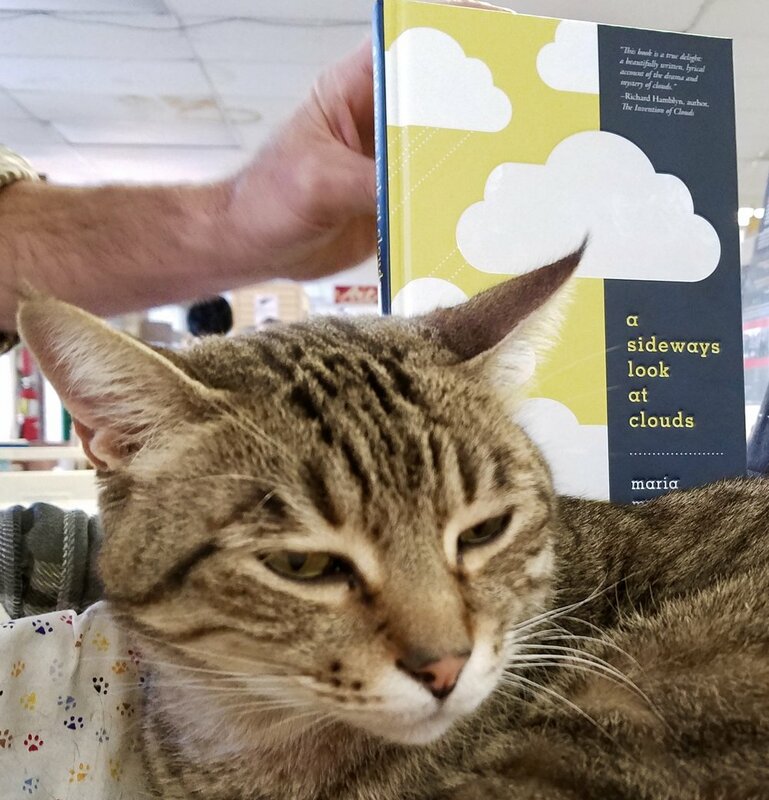 Maria’s latest book, A Sideways Look at Clouds (Mountaineers Books, 2017) blends science and humor to give the lay reader new ways to better appreciate the clouds. Maria is the author of more than a dozen books including Rare Bird: Pursuing the Mystery of the Marbled Murrelet. This program will be followed by book sales and signing. Things are looking up! John Dodge and I get very excited about storms, clouds, and the PNW Skies. Join Olympians John Dodge, author of A Deadly Wind (OSU Press, 2018) and Maria Ruth, author of A Sideways Look at Clouds (Mountaineers Books, 2017) at Browsers Bookshop for a conversation about wind storms, clouds, and challenges these writers faced writing about—and under—the powerful force of pressure. This event will include light refreshments, Q&A, and book sales and signing. Join me at the Whatcom Museum in Bellingham for my presentation to the North Cascades Audubon Society on the endangered marbled murrelet. What happens when you encounter a strange new bird? You ask a lot of questions of murrelet researchers, field biologists, forest ecologists, timber company executives, and yourself: Why does this bird matter? Why should anyone care about the murrelet? Do we have a moral obligation to save this bird or any other endangered species? Can we all move to the front line to protect earth’s beauty and biodiversity? In this slide-illustrated talk, I’ll talk about the natural history of the murrelet, current conservation efforts in Washington, and the important murrelet advocacy work of the Audubon community in the Pacific Northwest. This is event is free and open to the public. This a co-presentaiton by the North Cascades Audubon Society and the Whatcom Museum. $5 suggested donation/Whatcom Museum members free. 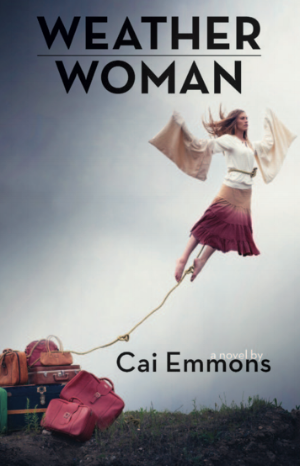 This wonderful novel by Cai Emmons will be out next week. Please join me and Cai for an evening of conversation about clouds, weather, science and story, intuition and inspiration. Copies of Cai’s book, Weather Woman (Red Hen Press, 2018) and my book A Sideways Look at Clouds (Mountaineers Books 2017) will be available for purchase and signing. In the tradition of Parisian salons of old, the Washington Center presents an intimate evening of music, theater, literature, and art. Local and regional masters of visual art, the written word, and music come together to share their experiences as artists and interact with you—the audience. Featuring Amy Shephard, Maria Mudd Ruth, John Dodge, Jim Lynch, Bryan Willis, and more in the Black Box Theater. Tickets: $12. Click here to order. During the 186 days every year Bend, Oregon, is officially "sunny," the sky can be covered by 15% or less by clouds. If the clouds had better PR, this would be a "partly cloudy" day. Learn about the clouds, our fascination with them, and why we don't talk about them more at my talk, Q&A, and book signing. I'll be sharing some science, humor, and thoughts on following your curiosity. Don't know much about the clouds but wish you did? After moving to the Pacific Northwest in 2006, Olympia nature writer Maria Mudd Ruth realized she knew little to nothing about these shape-shifting natural wonders. Rather than continuing to take them for granted, Maria began to study these shape-shifting natural wonders with curiosity and humor. In A Sideways Look Clouds (Mountaineers Books), Maria charts a unique course into the science and meaning of clouds and offers the non-scientist ways to look at, appreciate, and talk about the clouds. Join Maria for a slide presentation, Q&A, and book sales/signing. Birders and cloud watchers have much in common: they spend a lot of time in the field, their gaze is often skyward, and they have a good grasp of taxonomy. Yes! The clouds come in genera, species, and varieties, too! Join me and the Skagit Audubon Society in "big sky country" (Skagit County) for a program on my new non-fiction title, A Sideways Look at Clouds (Mountaineers Books, 2017). My presentation will include a talk, slides, Q&A, book sales and signing. This is part of the monthly program of Skagit Audubon and is free and open to the public. Olympia's skies are classified as "cloudy" 228 days a year. What do you know about the these shape-shifting natural wonders--cumulus, stratus, cirrus, and the rest? Join me tonight (Saturday) for my presentation on A Sideways Look at Clouds--my new book of non-fiction natural history published this Fall by Mountaineers Books. I'll be doing a combo talk/reading/slide program/ Q&A/ book signing... and cloud-shaped cookies for everyone at Olympia's oldest indie bookstore. AND FREE FULL-COLOR CLOUD CHARTS FROM NASA/NOAA! Orca Books is located at 509 4th Ave E, Olympia, Washington 98501. What kinds of clouds are these and why does author Maria Mudd Ruth want you to look up and notice them? Join Maria at Third Place Books in Seward Park for a reading/talk/Q&A about her newest book A Sideways Look at Clouds at this indie bookstore (the newest of the three Third Place Books stores in Seattle) Drink and food specials are available from their full-service restaurant Raconteur during the events, so grab a glass and join us! All are welcome, no purchase required. Third Place Books, 5041 Wilson Ave. South, Seattle, WA For directions, click here. Maria will be speaking briefly about her book during the "Authors on the Map" lunch on the first day of this 3-day trade show for book-industry professionals. Book sales/signing to follow. The event is not open to the general public. Click here for more information on the PNBA. Believe it or not, we have hundreds of kinds of clouds, not just "rain clouds." Learn about nimbostratus (seen through a rainy windshield) and other clouds in A Sideways Look at Clouds. Don't know much about the clouds but wish you did? 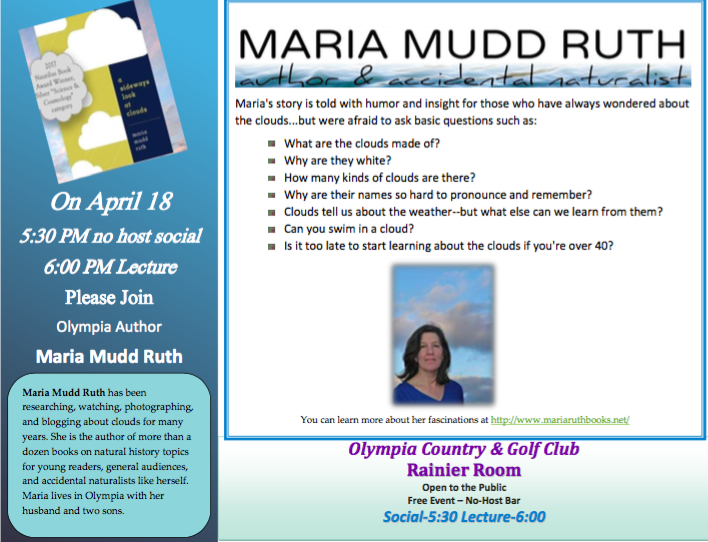 After moving to the Pacific Northwest in 2006, Olympia nature writer Maria Mudd Ruth realized she knew little to nothing about clouds. Rather than continuing to take them for granted, Maria began to study these shape-shifting natural wonders with curiosity and humor. In A Sideways Look Clouds (Mountaineers Books, September 2017), Maria charts a unique course into the science and meaning of clouds and offers the non-scientist ways to look at, appreciate, and talk about the clouds. Join Maria for a lively presentation, short reading, gorgeous clouds, and book signing. There might even be a quiz. Village Books is at 11th and Mill Streets in Fairhaven (south of downtown Bellingham). Join Maria at the Eagles Ballroom to celebrate the publication of A Sideways Look at Clouds, by Mountaineers Books. After moving to the Pacific Northwest in 2006, Olympia nature writer Maria Mudd Ruth realized she knew little to nothing about clouds. Rather than continuing to take them for granted, Maria began to study these shape-shifting natural wonders. In A Sideways Look Clouds Maria charts a unique course into the science and meaning of clouds and offers the non-scientist ways to look at, appreciate, and talk about the clouds. The launch party will include a presentation/reading followed by Q&A and book sales/signing, fun. Browsers Books of Olympia will be at the event to sell hot-off-the-press copies of A Sideways Look at Clouds (and also Maria's previous book, Rare Bird). Refreshing beverages and light cloud-themed nibbles will be served. Children welcome. 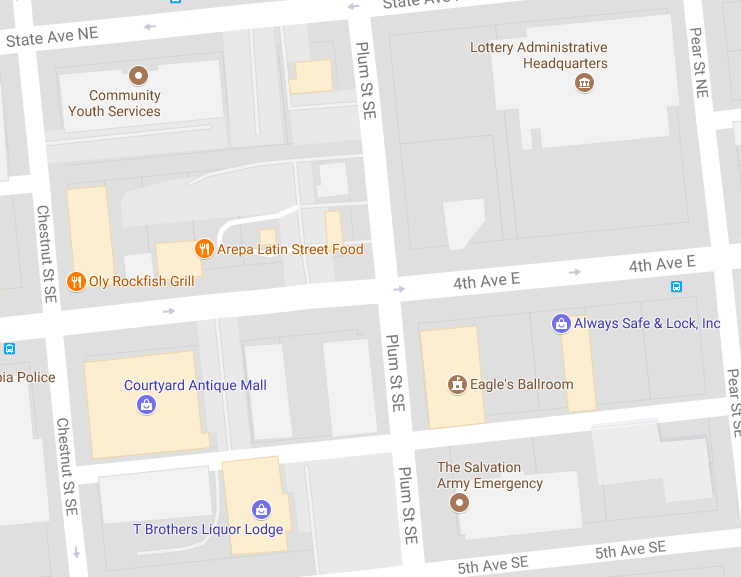 PARKING: There is free on-street parking on 4th and Pear St. (the most convenient). There are some spaces in the Eagle's Ballroom lot just north off the building off 4th. AND after hours at Always Safe & Lock just north of that. AND after hours in the larger parking lot of the Lottery Administrative HQ across the street. Author Maria Mudd Ruth fell in love with clouds the same way she fell for an imperiled seabird—madly and unexpectedly. Her infatuations, a decade apart, inspired her to undertake two book projects. But how does a non-birder find her way into the world of an elusive, little-studied bird? How does a non-meteorologist tackle the complex science and meaning of the shape-shifting clouds? And why would she want to? Find out as Maria discusses her latest books, the critically acclaimed Rare Bird: Pursuing the Mystery of the Marbled Murrelet and her newly released A Sideways Look at Clouds. Both books combine memoir, natural history, and humor—follow a steep and often bumpy learning curve as Maria pursues her enigmatic subjects. During her research adventures, Maria discovers a world of unexpected beauty, frustration, fascination, joy, and even solace. Maria’s program will highlight the value of curiosity, the common challenges of studying birds and clouds (and other things about which you know nothing), and the importance of forging abiding connections to the natural world. The program will be a combination of short reading from her two book, a selection of slides featuring stunning Pacific Northwest clouds, Q&A, and sales/signing of her two books. Outdoor sports enthusiasts, birdwatchers, and cloudgazers will find common ground as they discover new and fundamentally simple ways to enrich their experience of natural world. Program starts at 6 p.m. Doors open at 5:30. Cloud watchers, curious naturalists, citizen scientists, and Washingtonians in need of distraction will enjoy this talk by Maria Mudd Ruth, who was born in Washington DC and lived in the city and its suburbs for most of her life. A former member of National Geographic's TRAVELER magazine an author of over a dozen natural history books, including Rare Bird: Pursuing the Mystery of the Marbled Murrelet, Maria has been researching, watching, photographing and blogging about clouds for many years. Maria Mudd Ruth, is an entertaining and experienced speaker and her book presentation will interest a broad range of readers.